Family athmosphere, City Center and very kind staff , free internet ... It was a very nice and pleasant stay at D. Carlos. The staff spreaks few languages . The hotel has free internet acess and wireless at the room. Located opposite the city's garden and 50m from the word's oldest HEALTH SPA. 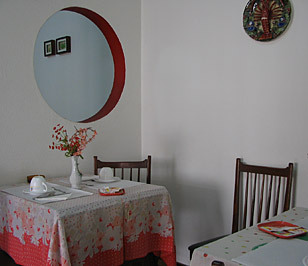 Situated 8 km from the beach, 30 km from Nazaré and Peniche, 5 km from Óbidos and 50 km from Fátima. Caldas da Rainha is one of Portugal's most beautiful regions offering visitors numerous points of interest in its surrounding areas. The friendly staff at reception will be happy to arrange activities on your behalf on request including tennis, golf, and swimming. Bathroom, direct telephone, TV satellite and safe in every room. We are open year around, 24 hours per day. Welcoming family atmosphere." we have free internet access for our guests (1/2 hour) and totaly free wireless system in part of the hotel. Bathroom, direct telephone, TV satellite and safe in every room. We are open year around, 24 hours per day. Welcoming family atmosphere." We have free internet access for our guests (1/2 hour) and totaly free wireless system in part of the hotel. Located opposite the city's garden and 50m from the word's oldest HEALTH SPA. Situated 8 km from the beach. Caldas da Rainha is one of Portugal's most beautiful regions offering visitors numerous points of interest in its surrounding areas. A credit card is required to secure your reservation at D. Carlos. If the reservation is not cancelled outside of the 2 days cancellation notice period, your credit card will be charged with the full amount of the first night's Hotel rates are the total price of the room and not the 'per person' rate. All prices are inclusive of all local taxes. Getting There:From Lisbon you have to get Highway A8 north. Go out after 80kms, on exit 17 direction Caldas da Rainha about 3 kms. Just in entrance you will see a Park D. Carlos and square/statu of quuen Rainha D. Leonor. Residencial D. Carlos is just in front of the park , between Queens? Statu and a Spa Hospital. Located opposite the city's garden and 50m from the word's oldest HEALTH SPA. Situated 8 km from the beach, 30 km from Nazaré and Peniche, 5 km from Óbidos and 50 km from Fátima. Caldas da Rainha is one of Portugal's most beautiful regions offering visitors numerous points of interest in its surrounding areas.